The BBC recently carried out a poll on the British social class. The survey identified seven social classes ranging from ‘elite’ at the top of the pie, to ‘precariat’ at the bottom. The survey, now posted online had 160,000 participants at the time the results were released. To indulge my curiosity, not unlike many of the participants, I entered some information on the platform to find out which class I belong. I was surprised at the outcome. Why am I interested in this experiment? It’s very simple. I had a discussion recently about how people are routinely put in their place in Nigeria, whether it is necessary or not. Work colleagues will decide how to relate to you based on their personal appraisal of your class. The measurement includes the way you dress, the type of car you drive, where you live, how you talk and where your children go to school etc. Our social profiling even dictates where you go to church and where you are seated in the pew. A friend told of a particular lady at his work who never gave him as much as a glance each time he greeted her. One day, they met at the car park and when she realised he drives an SUV, she had a paradigm shift and changed her behaviour towards him. What’s my point with this discourse. As much as the United Kingdom appears to be infatuated with social classification, the system is not played in your face. You would have to put on special glasses and search hard to notice it. Many upper class people who attended the very posh schools and are armed with double barrelled names are almost embarrassed by their privileges, preferring to keep things on the down low. In Nigeria however, social classification plays out in every day life. This is rather interesting given that unlike England, Nigeria does not appear to have a unified institutionalised social class system. 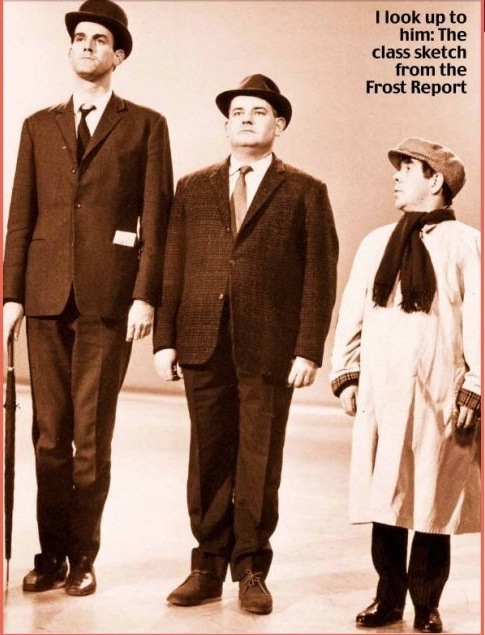 Ironically, what describes Nigeria class system really well is ‘The Frost Report’ sketch of the mid 60s that poked fun at the British class system. It featured average height Ronnie Barker saying to a much taller John Cleese "I look up to him because he is upper class". To shorter Ronnie Corbett, he said: "But I look down on him, because he is lower-class. I am middle-class." I suppose many Nigerians probably like the concept of the class system. This affection is based on the hope that they too will eventually make it to the upper class. It becomes a problem however, when it is flaunted at you daily. "Am I in your class?" "Do you know who I am?" "Who do you think you are?" "I’m not your mate" are some of the many phrases we employ to oil the class system in our country. Back to England, a common expression within the Nigerian community is that ‘London is a leveller.' In other words, London allows people, who will otherwise not smell your taillight in Nigeria, to not only ride with you but also have the audacity to ask you out, and worse, marry you.